Today’s townland is right in the heart of Belfast, but it didn’t exist until the 1840s. When a deep channel was cut through the mudflats of the river Lagan, the material excavated from the cut was used to form the artificial Dargan’s Island. The name “Queen’s Island” came later, in honour of Queen Victoria’s visit to Belfast in 1849. I snapped Queen’s Island through the car window as I crossed the Lagan Bridge on the M3. From here the grassy area looks like an island sticking out into Belfast Harbour, but the island is actually firmly attached to the neighbouring townland of Ballymacarrett Intake. In 1853 Robert Hickson started shipbuilding on Queen’s Island. He appointed Edward Harland as general manager. By 1861 Edward Harland had bought the shipyard and gone into partnership with Gustav Wolff, creating the Harland & Wolff company which went on to build many ships, most famously, the Titanic. 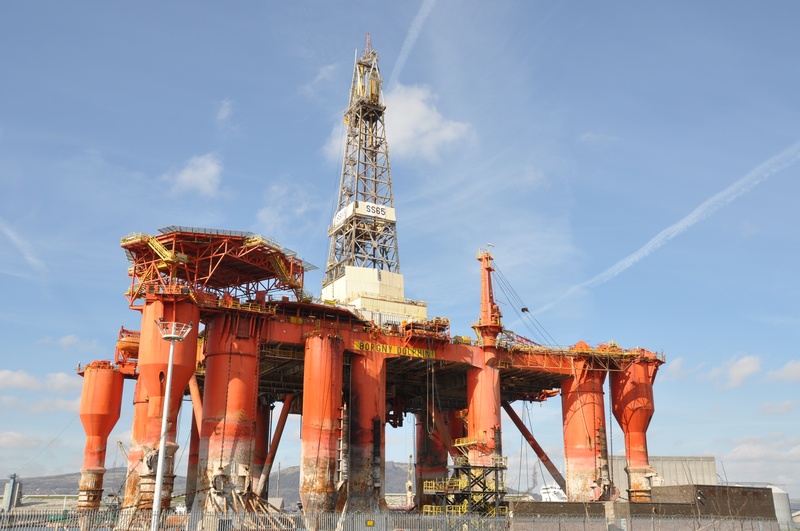 Harland & Wolff is still there, and the dock is still used for repairing ships and oil platforms. Land which is no longer used for shipbuilding has been regenerated as Belfast’s “Titanic Quarter”. Close to the site of the design, construction and launch of the Titanic, we have a new museum called Titanic Belfast, in a beautiful spiky building which opened in 2012. Newer businesses have spread onto the island too, as Northern Ireland enjoys a growing reputation for film and television production. The next development is old and new at the same time. HMS Caroline is one of a handful of surviving warships from the First World War. The ship fought in the Battle of Jutland, just off the coast of Denmark. The plan is to convert the ship into a visitor attraction in time for the centenary commemorations of the battle in 2016. 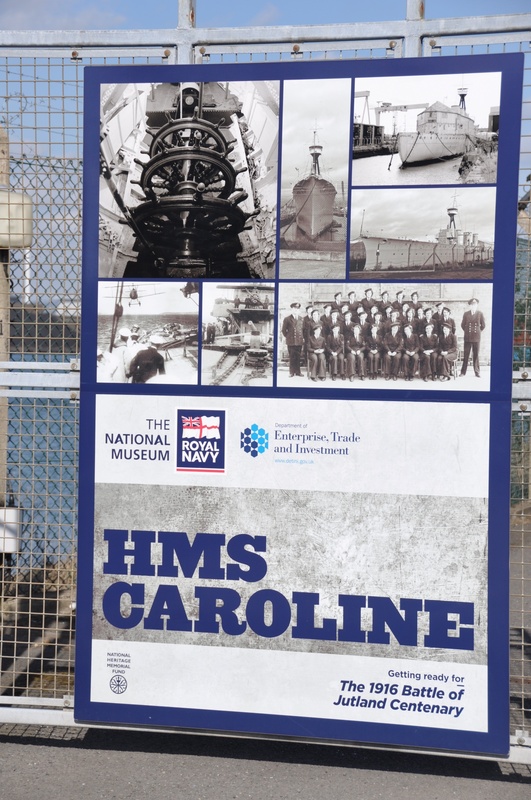 Click here to read the latest news from the Ministry of Defence on the HMS Caroline project. Click here for the website of the visitor attractions at Titanic Belfast. 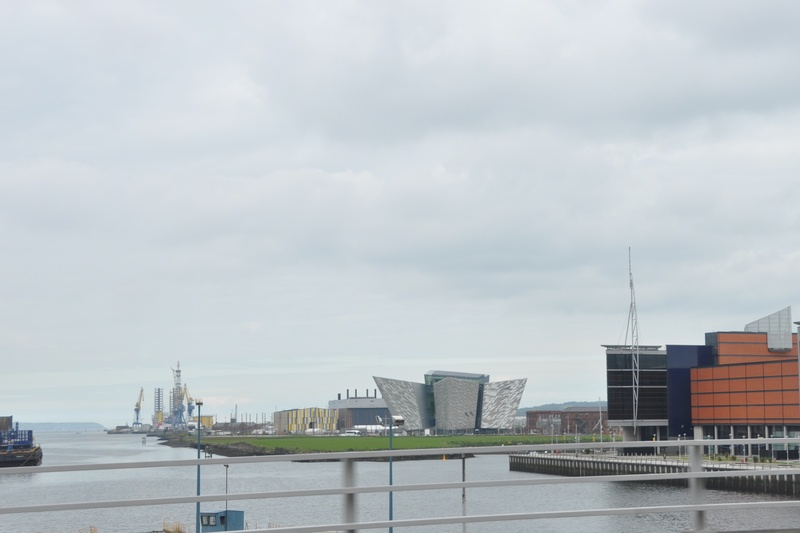 Click here to read about the Titanic Quarter. I love the spiky building. Great architecture. It actually deserves a post of its own on Distant Drumlin. I must make a return visit.